Please copy and paste ' [[Category:Catfish]] ' into the end of your article to include it in this category. Catfish (order Siluriformes) are a diverse group of ray-finned fish with over 2,700 species known. Named for their prominent barbels, which resemble a cat's whiskers, catfish range in size and behaviour from the heaviest, the Mekong Giant Catfish from Southeast Asia and the longest, the Wels Catfish of Eurasia, to detritivores (species that eat dead material on the bottom), and even to a tiny parasitic species commonly called the Candiru, Vandellia cirrhosa. There are armour-plated types and also naked types, neither having scales. Despite their name, not all catfish have prominent barbels; members of the Siluriformes order are defined by features of the skull and swimbladder. Catfish are of considerable commercial importance; many of the larger species are farmed or fished for food. 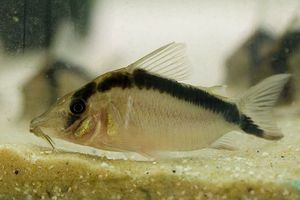 Many of the smaller species, particularly the genus Corydoras, are important in the aquarium hobby. A flattened head allows for digging through the substrate as well as perhaps serving as a hydrofoil. Most have a mouth that can expand to a large size and contains no incisiform teeth; catfish generally feed through suction or gulping rather than biting and cutting prey. However, some families, notably Loricariidae and Astroblepidae, have a suckermouth that allows them to fasten themselves to objects in fast-moving water. Catfish also have a maxilla reduced to a support for barbels; this means that they are unable to protrude their mouths as other fish such as carp. 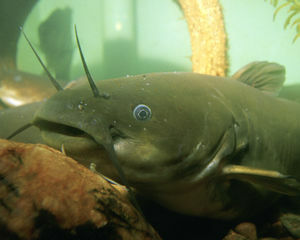 Catfish may have up to four pairs of barbels: nasal, maxillary (on each side of mouth), and two pairs of chin barbels, although pairs of barbels may be absent, depending on the species. Because their barbels are more important in detecting food, the eyes on catfish are generally small. Like other ostariophysans, they are characterized by the presence of a Weberian apparatus. Their well-developed Weberian apparatus and reduced gas bladder allow for improved hearing as well as sound production. Catfish have no scales; their bodies are often naked. 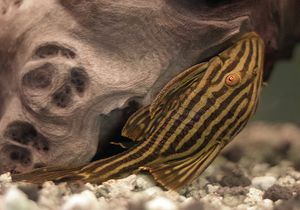 In some species, the mucus-covered skin is used in cutaneous respiration, where the fish breathes through its skin. In some catfish, the skin is covered in bony plates called scutes; some form of body armour appears in various ways within the order. In Loricarioids and in the Asian genus Sisor, the armour is primarily made up of one or more rows of free dermal plates. Similar plates are found in large specimens of Lithodoras. These plates may be supported by vertebral processes, as in scoloplacids and in Sisor, but the processes never fuse to the plates or form any external armour. By contrast, in the subfamily Doumeinae (family Amphiliidae) and in hoplomyzontines (Aspredinidae), the armour is formed solely by expanded vertebral processes that form plates. Finally, the lateral armour of doradids, Sisor, and hoplomyzontines consists of hypertrophied lateral line ossicles with dorsal and ventral lamina. This page was last edited on 18 March 2011, at 21:38.